First, I need to get over this overwhelming emotion that I have. I have escaped my dark past and have been reborn as “Bagel (baby-faced, glamorous)”. This is MiMi★. I hope everyone is happy as I am. Clap, Clap, Clap. This is me before the augmentation. I thought that this would not be my complex, but as time passed, I became less confident. I had to think about whether to wear a bikini or not. I couldn’t expose my body. I could not make up the volume although I used pads for my bra. This is a BIG STRESS!!!!!!!!!!!!!!! If I had a problem with double eyelid or nose, I would have gotten a cosmetic surgery right away. But, breast augmentation is something big and I think to think about it a lot. After thinking about it a lot, I came up with a conclusion that I need to do this now, when I am pretty, not later. So, I visited the hospital. After the registration, I talked to a counselor and the doctor. It was a male doctor, so I was kind of embarrassed…. He asked me what size I wanted. I told him that I wanted a ‘B’ size, one size that all women hope to have. He looked at my breasts and saw that the width was small so if I make my breasts too large, it might look awkward. He recommended that I put more volume on the part below the collarbone. So we decided on the anatomical implant. 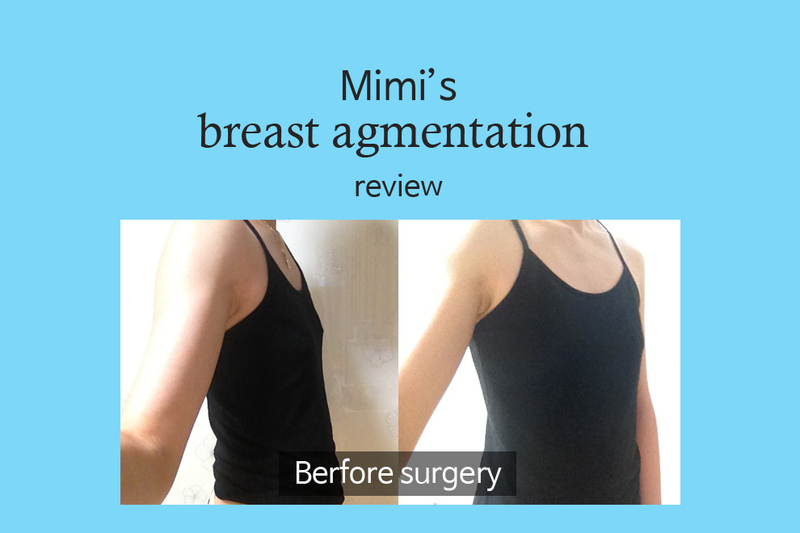 I needed to go to work right after the breast augmentation so we decided on the inframammary fold incision. We set the date for one week later. I waited for that date with great anxiety. We took the x-ray, talked a little about the design, and went straight to the surgery room. This was my first surgery ever, and so I get really nervous and scared. Anesthesiologist came in and said “Just relax and take a nap”. I went straight to Andromeda after that. This was my voice !!!!!!!!!!!!!!!!!!!!!!!!!!!!!! I was a little scared at first but it was because of the medication, phew. I was in the recovery room for about an hour. A nurse came to me with a painkiller and told me to stand up. I got up right away. 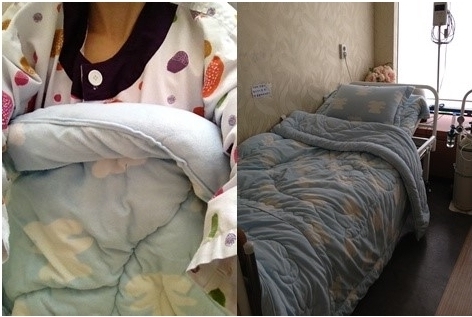 I got changed, made a reservation for the next day check-up and left the hospital. Oh, I went into the surgery room at 11:30 and left at 3pm. I was a zombie on my way back home. I went alone and so I was lonely……………. But I was proud of something. Hahahaha. I was really excited so I took a selfie when I got home. Now, now, the introduction got too long. There was some hardening and pain because of the pressure bandage but it wasn’t difficult to move my arms and lie down and get up!! I think it is right to say that I have changed after I got up from my sleep. It was a plane before but my breasts are reborn with the doctor’s technique and I am reborn as a ‘Bagel’ girl. The counselor told me it would be better to move about rather than staying at home. This is a picture of me before sterilization. The swelling is worse and the bruises came down as well. The stomach is hard so if I press it, there is pain but the doctor told me that my recovery is quick~!! This is me in my underwear. 75a cup is full now. The bruises are not yet healed so I kept on the pressure bandage. I need to move my arms a lot because of my job, and I could not get a vacation as well. So, I got into the office right after the surgery. I was comfortable with my arm movement on the day of the surgery but it is getting even better with time. But I can’t be too aggressive. There are still some swelling but I need to remove the stitches. The stitches do not feel like my skin. This too gets better with time. This is my second check-up. I heard that I can use the pressure bra now. The swelling has gone down a lot. I am still in the recovering stages and I feel a little stiff when I get up in the morning, but I get surprised whenever I see my breasts in the morning. They tell me that anatomical implants make my breasts look natural with time. I am happy because my friends show more interest on me.